Yes, Mombot in Real Life would target earlobes, underarms, torsos – you name it – for pinching with her toes for punishment. Heck, sometimes she’d pinch my sisters and I when we least expected it, just for giggles. We’re (fortunately) much bigger and taller now, so there’s less opportunity for her pinchings, I’m happy to say. I’ll keep this blog post short today as I have some last minute packing and organizing to do for the Phoenix Comicon (which I’ll be leaving for tomorrow)! For updates on the convention, follow me on Twitter or Facebook. I’ll try and keep both of those places updated whenever I have time. Okay, I’m off to get stuff done. Hopefully, I’ll see some of you at the JEFbot booth (#800) in Phoenix! Okay that last shot is just CREEPY! ha! yeah, it is pretty creepy, Jereme. but that’s exactly what it’s like to have a mom with killer toes!!! I don’t know, I think Mombot looks awesome. I can’t quite explain it. At least, not without sounding creepy. Hey, why does the Cornfather have “negative” eyes (white pupils and black irises), and no sclera (had to look it up) whatsoever? 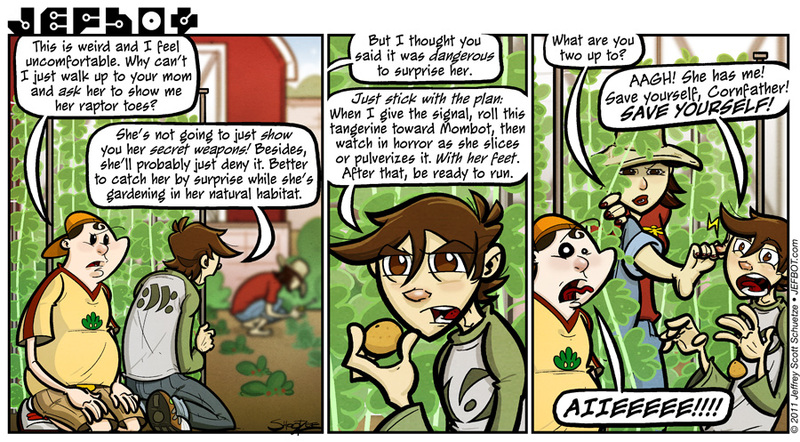 The last panel brings out this trait, perhaps a little too much, hehe. you assume correctly, Kim: the two of them never left their childhood. (at least jefbot didn’t.) heheh. Not the ear! Not the ear! I love it that Mombot gardens barefoot. I’d be terrified of doing that — there are . . . annelids out there. Then again, I don’t have raptor toes. Sloth, maybe; I have the claws, but they’re mostly for defense. yeah, i wouldn’t garden barefoot either, Sarah W – in addition to annelids, i fear the earwigs. i remember when i was a kid and digging in the backyard, an earwig pinched my pinky and wouldn’t let go. they’ve been on the Kill List ever since for breaking the truce. tomorrow’s gonna be crazy getting everything ready for Phoenix, DJ, but once i’m there, it should be totally fun! This is frightening on so many levels, bot. But I still love it. I love the colors and I love the action. And I love that now I know I can always use Mombot’s toe if I’m ever in need of a can opener or corkscrew. 😉 Great job, bot. you had access to Mombot’s toe at the Phoenix Con all weekend, MC – you should’ve used it then! I think mothers all have at least one superhuman talent. That’s part of why labor is so excruciating. Their very genetic fiber is mutating to give them super powers. My mother gained superhuman hearing, danger sense, and the ability to change size at will, going from a diminutive 5’2″ (yes both my mother and stepmother are exceedingly short while I am almost six and a half feet tall), to a towering rage machine the moment me or my sister are in danger. it’s true, Psynapse – women have way higher pain tolerances than men. it’s a scientific fact! and since i have a mom and two sisters, i can totally relate to your “rage machine” comment, too. heheh. Aaaaghhhhhh! Fear the toes! Fear the toes! This is too funny. Cornfather’s expression is priceless. I think he’s gonna have nightmares for a while following this experience. Mombot FTW! I’m kind of doubtful we will make it to the Comicon this weekend, cause I have an all day training on Friday. So we would have to leave after about 6:00. But I am still looking for some last minute cheap flights! no sweat on the Comicon, shanna. while i would’ve loved to have you and Taranchilla there, i’ll be doing more conventions in the future, so hopefully i’ll see you both at one, soon! i think you’re right about the nightmares, shanna – jefbot should totally put on Jurassic Park when they get back to the apartment, just to further influence the terror. heheh. would actually love to have jefbot say that phrase at some point, but the “funny” is really in the delivery and i’m not sure it would translate in a comic strip. maybe i’ll bring it out if/when the JEFbot cartoon gets produced! Screw lungs! I had to laugh (and I missed my diabolical laughter of doom!) So funny. Mombot is awesome. But now I believe that Michael may be forever terrified of her. Poor Michael. Holy Sheet! Get out! SAVE YOURSELF! LOL This cracked me up. She so Nonchalant about it. La Di Da in the garden….I feel a disturbance in the child force and HA got one! Feet near the face…eww…unclean…UNCLEAN!!! Feet are horrible little creatures…gross, gag, yuck! HA HA HA HA HA! There can never be too many “Jurassic Park” references. Run Jefbot! Must go faster! agreed, Angela – while the film does have its flaws, i still absolutely love it! Oh, that’s awesome! I love the twin looks of horror on the boyos’ faces! Yeah, my mom gained supersonic hearing and a keen sense of smell; I swear she could always tell when I’d done something wrong because I’d smell like fear or guilt. (I have the same power, to a far lesser extent). Best of luck at the Comicon! Any word yet on the possibilities of going to the Mid-Ohio con, where I’ll be donning my stalking cap? no word on the Mid-Ohio con, yet, but i’m still planning on appearing at some other cons before the year’s up, so i’ll let you know. if so, i’ll be sure and wear my stalkee cap! yep, with as many times as jefbot’s seen Jurassic Park, you’d think he’d know the attack would come from the side, TCG! YES! This is awesome! I LOVE the third panel!!! So funny. And your mom is beautiful- even with the claws of death! Excellent job Jefbot! thanks, FunnyShaffer! and you’re right about Mombot – you should’ve seen her toenails this weekend since they were nicely painted to hide the deadliness. I love the image of her stroking jefbot’s face with her toe. Maternal yet creepy. Actually, she doing the ear pinchy thing on Jefbot. A basket of Tangerines: $1.50; Pedicure: $5.00; seeing CF scared to death face: priceless. It would appear that Cornfather knows just the right time to panick. Superb facial expressions, thanks for the lols. And Natural habitat – priceless. Speaking of which, nicely drawn garden. That had to be my favorite part of that movie. Clever girl. one of mine, too, Anime fan. definitely the most quoted scene for me! thanks for the ROFL, Insectoid! Cornfather’s expression in the last panel is priceless. I personally don’t have a problem with feet as long as they’re not excessively gross or belong to someone I don’t like. you know that AnhedoniaBlue/LAWLS will be at pheonix too right? i only found out very close to the opening of the con, acolyte! fortunately, i was able to hang out with Joenis and eat and drink with him pretty much every night. was rad. raptor toes in action! Gasp! Be thankful she’s not using them to pinch! my bad… she really did pinch! ouch! oh hell at least she didn’t slash right? that’s right, Jiro – also happy she didn’t use them to snip or crush! and as we know from Jurassic Park: everything can go wrong when dealing with living creatures with sharp teeth and claws, Jaeh. heheh. sorry you couldn’t make it to the con. if i had a private jet and unlimited cash, i’d fly as many readers as possible to these things! this happened to me too, little grasshopper…. glad you enjoyed his terror, MrSnow! will be providing more opportunities for that next button, soon. yep, and raptormoms are even more sneaky, cunning and deadly, ZL! Can’t wait to hear all about the Con with Mom and Pop Bot and the CF! I’m speechless. This can be a supreb blog and very attractive too. Nice work! That’s now not actually a lot coming from an newbie publisher like me, however it’s all I may just say after diving into your posts. Nice grammar and vocabulary. Not like other blogs. You actually recognise what you?re talking about too. Such a lot that you made me want to discover more. Your blog has develop into a stepping stone for me, my friend. That’s right, “Least I Could Do” Is going to have a pilot episode of a cartoon series, but need the support of everyone they can to get it off the ground! Please consider donating, or at least spreading word of this. Because THIS MUST HAPPEN! Gratz on getting exposure you deserve! I was at the PCC this weekend and saw your booth. I’m glad I stopped long enough to get a card, this has been awesome to read. I have been using the “Clever girl” comment a lot lately when I am gaming and I get flanked…No one seems to remember the line! I will have to just lead them to this strip to refresh their memory! you must be playing with some lame gamers, Slave1! “Clever girl” is like, one of the best lines evar. you must edumacate your peeps! Ha HA! Watch out. You may have given Mombot some bad ideas.